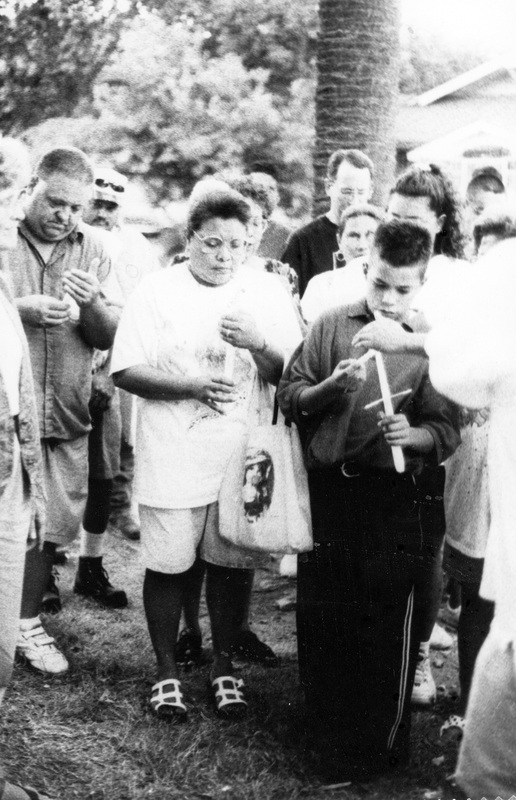 DOWNLOAD a 34-page PDF document of the peaceCENTER archives of the 1997 vigils at sites of violence. 30 Nov. 2014: as soon as they get scanned, that is . . . The newscasts had an eerie feel to them. There were five black body bags that passed across the television screen. What was even eerier is that the same footage was repeated for weeks following the massacre on West French Place in 1997. News reported that the four teenagers and a father to one of them were shot in the back with their arms and wrists duct taped behind them. It is a horrendous story for a neighborhood and community to share — for families and friends to live through and find peace again. The story and its images were hard to bear. At the peaceCENTER we had heard that some people in other parts of the country were holding prayer vigils at sites of violence. The possibility seemed to make sense in the situation but we had no idea how to plan a vigil or what it might look like. We started by picking a date and time. After some research we were able to locate and contact the families to invite them. One of the peaceCENTER’s contacts was called at a police substation to let them know what was being planned. Twelve community faith leaders from various traditions were also contacted, invited, encouraged to invite others and come with a candle. Somehow the news of the vigil leaked out to the media. By dusk on the designated day media trucks, reporters, camera operators, and another 120 people came ready. Neighbors cautiously came out their front doors and joined us for what became a two-hour vigil. People were invited to gather together and encircle the family members. When we were ready to begin, three TV cameras were in the center of the circle with the family members. Those who attended were thanked for coming, reminded that we were people of many faiths, and invited to share prayers respectfully. Poetry followed prayers that produced tears and holding of each other that inspired more poetry and more prayers. When moments of silence occurred, people were asked if there were any more prayers. This prayerful ebb and flow continued until no one else responded. And without any encouragement those gathered began to naturally walk around the house where the killings occurred. Candles were planted into the ground near the foundation. Hands touched the sides of the house as if in blessing. Someone began singing Amazing Grace and by the third note most had joined in. Camerapersons expressed their thanks for the beauty of the images and something healing to put on the news. Neighbors shared how much better they felt because of the vigil experience. Most of them hadn’t been out of their homes since the violence except to go to work and buy groceries. For another hour family members embraced and swayed back and forth singing to one of the victim’s favorite songs playing from a car stereo. It was a warm night in August. Excerpt from “Peace is Our Birthright: the p.e.a.c.e. process and interfaith community development” by Ann E. Helmke and Rosalyn Falcón Collier (peaceCENTERbooks, San Antonio, TX, 2003) p. 45-46.